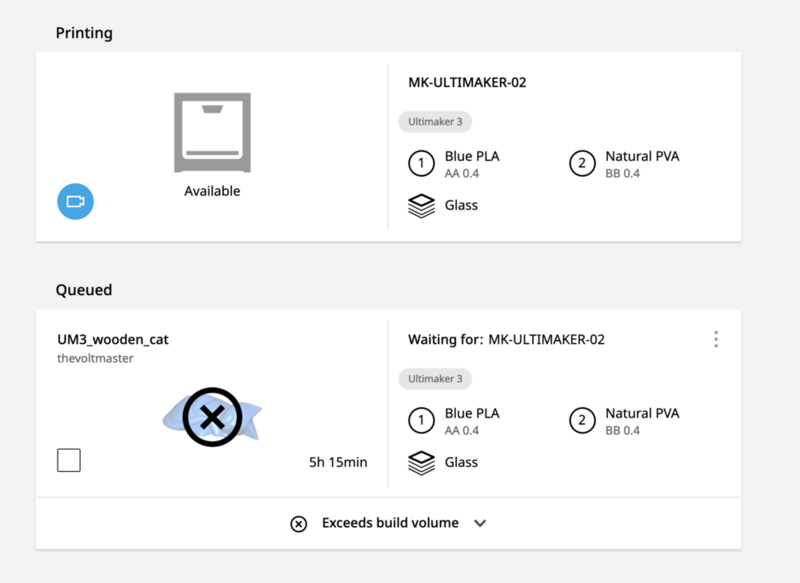 After upgrading my Ultimaker 3 to the latest firmware, and installing cura 4.0, any jobs i submit to the printer over the network fail with the error "exceeds build volume" despite the object being small and centered on the bed. 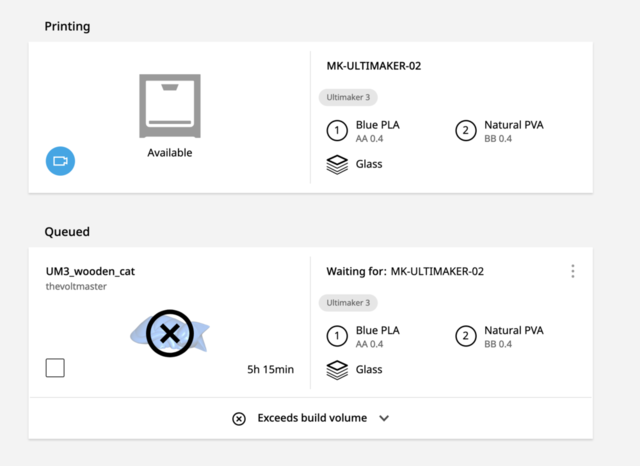 i even deleted everything in my configuration folder hoping to reset cura to a working state and after re selecting my network printer still had the same issue. what could i be missing? It seems that the print size that Cura generates is a bit too big, so that's likely the culprit. I've added the issue to our backlog! I had a very similar problem on a reprap delta printer. CURA 4.0 on a Windows 10 home computer. But did it generate g-code outside of the buildplate? The issue reported is about UM3 and the bounding box it generates, so i'm pretty sure it's a completely different issue. I too am now getting this error. Was fine but today its refusing to print anything w or without support. everything is well within the bed edges. Weirdly it only just stopped working. but now the issue is latched and will not work any more. I have not read through the g-code to be certain, but the g-code clearly told the print head to go past the build volume. 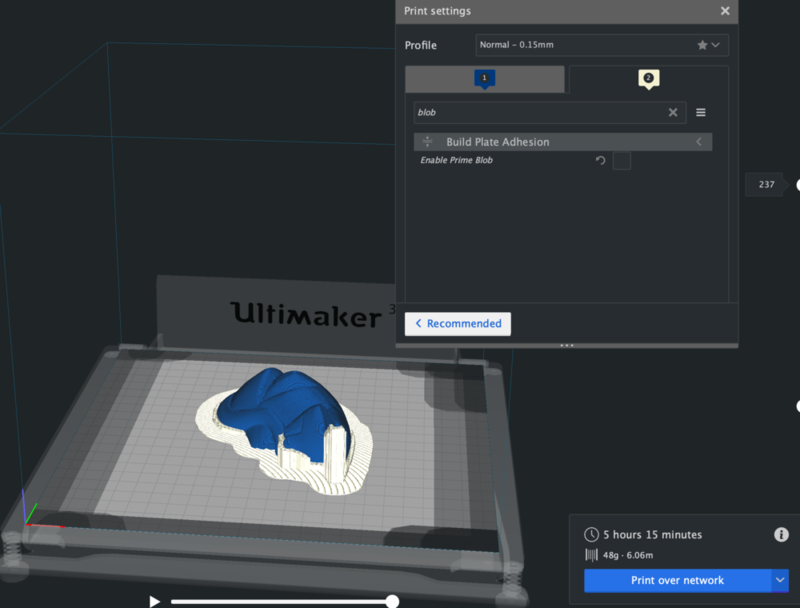 The same model with S3D worked correctly and the same model and settings worked fine with CURA 3.6. CURA did not warn me that the the head went out of the build volume though. What is really strange though is that my vanilla Marlin firmware would normally refuse to print outside of the firmware established print volume. So, some code was sent that bypasses that safeguard in the firmware. That may provide a hint. I too went back to 3.6. The potential for damage to the printer is too high to experiment with this much. My error may or may not be related to the OP error. I think that I will move this to a new thread and not taint this one. Suddenly thought is it ‘max comb without retract’ that could account for the out of range issue, tried it again reducing the comb from 15 to 0 and still the same error. I keep pressing ignore till i can print and it seems ok. but not an ideal fix.